Last night Promoe’s release party for his swedish album “Kråksången” went down at Pluto in Västerås. Tonight it’s time for Promoe to take stage at Ljunggrens in Stockholm. The release date for the record is 29th of April and you can pre-order the album as usually over at Bengans. And since yesterday evening you can listen to “Kråksången’s” all fifteens tracks featuring Supreme, Timbuktu, PST/Q, Organism 12, Afasi, Vincent and Magnus Betnér(?!) at Promoe’s MySpace! I haven’t listen to the album yet but I guarantee that we will come back with a review on the record later on. Happy listening! 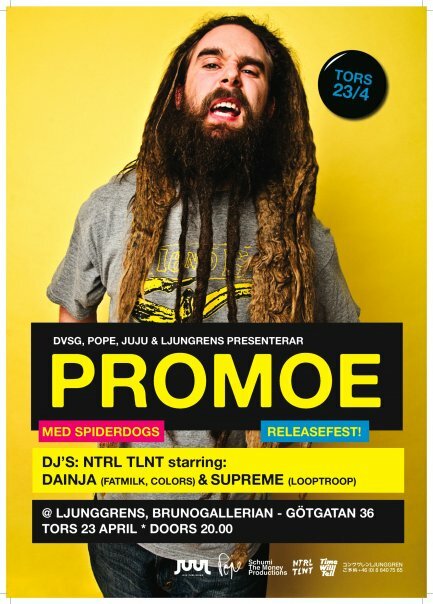 This entry was posted in Nyheter and tagged Afasi, DVSG, JuJu Records, Kråksången, Ljunggrens, Magnus Betnér, Organism 12, P.O.P.E Records, Preview, Promoe, PSTQ, Release, Supreme, Timbuktu, Vincent on April 23, 2009 by Niklas.